Between 1609 and 1768, one of the unprecedented colonizing phenomena in the world took place in the border line where Brazil, Paraguay, Uruguay and Argentina are today. The so called Jesuit Province was formed by 30 settlements, which grew until they achieved a technological and social development not expected by the Spanish Crown. Consequently they were expelled from America, leaving trace of their culture, urbanism and architecture. Today the region of the ‘Guarani’ Jesuit Missions offers the visitor the opportunity of learning about this exciting history combined with rich nature. San Ignacio Miní: It was founded in 1632. 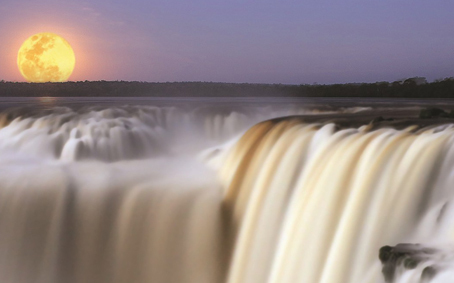 This ‘World Heritage’ as declared by Unesco, is located 60 km from Posadas City and 237 km from Iguazú Falls, along National Route 12, in the heart of San Ignacio. Because of their state of conservation, the tourist faces the urban and architectural magnitude built in the XVII century. 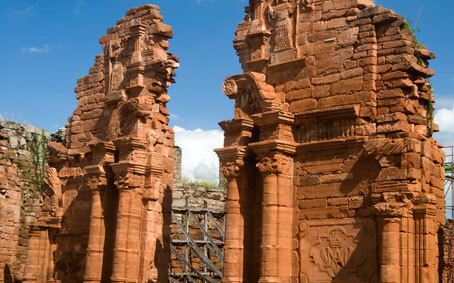 At the entrance of the Ruins, the ‘Centro de Interpretación y Recreación Jesuítico-guaraní’ is found, with its 9 rooms where the history since the arrival of the Spanish settlements is narrated and the models of Santa Ana, Loreto, Santa María, Candelaria (Argentina) and Jesús Tamandare (Paraguay) models can be observed. 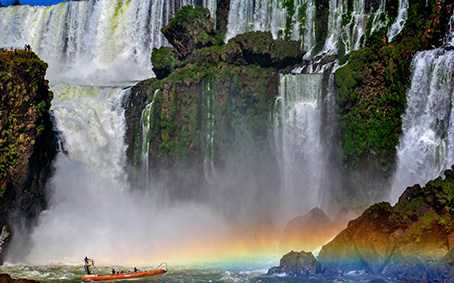 Iguazú National Park is located in the northwest of the province of Misiones, at 11 miles from Puerto Iguazú. 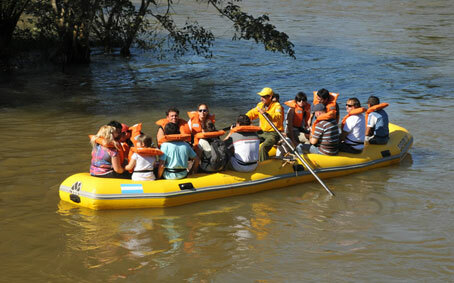 Its preserved ecosystem belongs to the Paraná Jungle eco region that covers almost all the provincial territory. 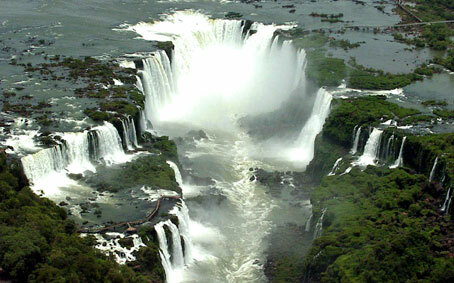 The natural treasure being hosted are the Iguazú Waterfalls: 275 waterfalls that reach an altitude of almost 260 feet. They were declared one of the New Seven Wonders of Nature in the World and, also, Mankind Natural Heritage. 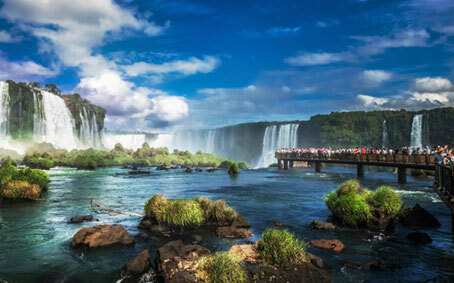 The visit to Iguazú National Park requires, at least, a complete day. Among the recreational proposals, it is worth mentioning: the Yvirá Retá Interpretation Center, the Lower Walk (4,600 ft of walkways with stairs); the Upper Walk (4,200 ft of walkways without stairs); the crossing to San Martín Island; and Macuco and Yacaratiá Pathways. 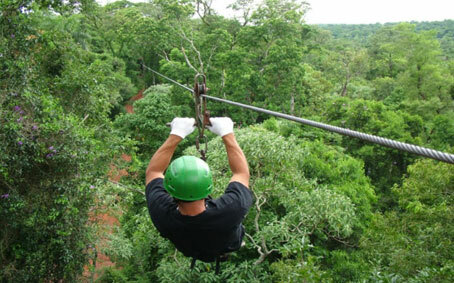 There are alternative tours to discover the Park and get close to the Waterfalls by means of full of adrenaline activities. One of the newest proposals consists in enjoying the Waterfalls under the moonlight, during full moon clear nights. Visitors only need to go to the Park at sunset, take the little train that crosses the jungle and get into the dark. The silence is only interrupted by the sounds of night animals: a new world awakes at the depth of the jungle. When getting off the train, it is necessary to take the same pathway that reaches the Devil’s Throat: in the evenings it is more mysterious and even more charming. The roar of the jungle increases step by step. And, finally, the Devil’s Throat amazes and moves evening visitors. Illuminated by a giant and silver moon, it is even more breathtaking. A unique landscape and an unforgettable experience.